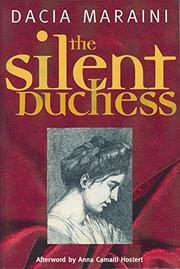 The Silent Dutchess ($19.95; Nov. 21; 264 pp. ; 1-55861-194-0): This prizewinning 1990 novel by one of Italy’s foremost writers (Voices, 1997, etc.) deftly juggles a strong feminist statement with a beautifully specific re-creation of 18th-century Sicily. The protagonist, Marianna Ucrça, born into a wealthy aristocratic family, is stricken deaf and dumb following a sexual assault suffered in early childhood, and thereafter pronounced helpless by the paternalistic culture incarnated in her powerful, loving, and condescending father. Marianna’s sedulous cultivation of her unafflicted other senses, and gradual realization of the world of empowerment that reading and writing offer to her, are searchingly explored in a carefully paced story of intellectual and moral growth—a story that’s as much a charming fairy tale as an impeccably realistic chronicle of one woman’s painstaking ascension to self-expression and independence.